Glamping (that is glamourous + camping) is growing fast globally as a trend in travel & hospitality. Africamps takes the glamping experience one step further offering a unique customer experience, amazing hosts and a great balance between sustainability and comfort. Plus, with such a great design you will wish your home was like this. A boutique camping experience otherwise known as – Glamping is a type of boutique accommodation that helps guests to interact with nature and its surroundings without asking them to forget their comforts. Africamps is the way to offer luxury as the most natural thing. Located on wonderful estates and working farms in South Africa guests have the chance to explore the beauty, interact with the locals and experience the culture in a holistic and refined way. A great alternative to ordinary holidays in a B&B or a hotel. 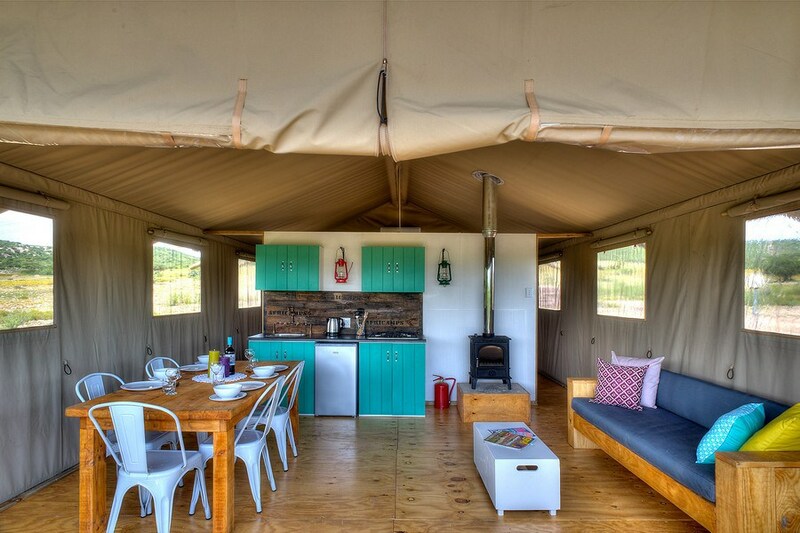 The self-catering units offer the international and local traveller a unique luxury South African camping experience without the added pressure of packing camping gear, limited space and having to deal with uncomfortable beds. AfriCamps tents are produced and handcrafted in South Africa, providing all the comfort of a permanent structure. Each tent has tailor made real furniture, bathroom, a fully equipped modern kitchen and a solid wooden floor. Style and quality are essential adding a romantic, relaxed lounge atmosphere. Each tent has a spacious open plan lounge area with a comfortable couch, a beautiful dining room area with solid wooden table for 5 people, a fireplace for winter months, air conditioning for summer nights, two bedrooms with queen size beds with their own private bathroom, hot shower cabin and flushing toilet. One of the bedrooms also contains an extra single bunk bed, so the tent can comfortably sleep a family of 5. The private wooden deck at the front comes with comfortable wooden loungers from where you can enjoy the view of the peaceful natural surroundings and even pull up the front covers when it’s hot and transform it into a big outdoor living area, ideal to unwind and enjoy the peace and harmony of nature. The tented camps are situated at authentic working farms and estates. In partnership with the landowners, guests can enjoy various handpicked outdoor experiences and sleep under canvas in order to re-discover life in the country. From hiking to hammocking, seclusion in nature & romantic escapes, to family outings with kids and merry chaos with friends. Six AfriCamps locations can be found across South Africa. AfriCamps Klein Karoo in Oudtshoorn, AfriCamps at Kam’Bati in Swellendam, AfriCamps at Pat Busch in Robertson, AfriCamps at Stanford Hills in Stanford, AfriCamps at Ingwe in Plettenberg Bay and AfriCamps at Mackers in Hazyview. AfriCamps at Oakhurst will open on 1 October 2018, adding an extra stop to your Garden Route tour. Set in The Klein Karoo. 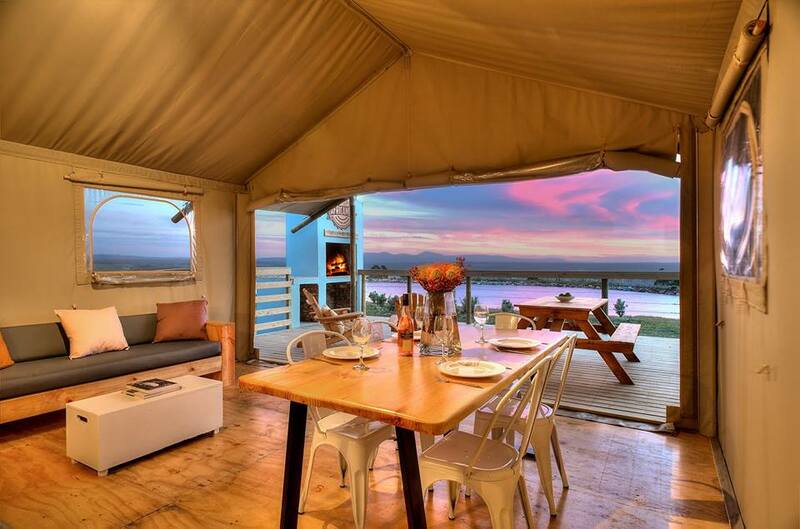 On one of the biggest working, Ostrich farms in Southern Africa with 5 luxury Africamps tents. Guests can see and learn everything about this uniquely South African industry. A big portion of the 10.000 Ha farm has been made available to a wide variety of free-roaming indigenous game like zebra, springbok, blue wildebeest, kudu, impala, eland, waterbuck and nyala. The wildlife here just forms another highlight for you to experience. The location is only 10 minutes from Oudtshoorn town centre and just a short drive from the Garden Route and right in the heart of the unique Karoo landscape overlooking the Swartberg Mountains. Join them and experience AfriCamps Klein Karoo and both their families’ lifestyle first hand. AfriCamps at Kam’Bati is situated on an Overberg farm about 20km west of Swellendam. The Sonderend River and Breede River meet on the property and our 5 luxury Boutique Camping tents are located in a beautiful and quiet patch of forest close to the river. AfriCamps at Kam’Bati is a nature lovers’ paradise and the perfect getaway for the adventurous family. There are canoeing, mountain biking and fishing facilities and there is a shared swimming pool for the children, while the picturesque town of Swellendam is only a short drive away. Our glamping tents at Pat Busch Mountain Reserve are tucked away in the Cape fynbos and look out over a folded green valley with the Langeberg as a gorgeous backdrop. The possibilities on the property are endless and include several walking trails, bird watching, fishing for bass and swimming and paddling in the farm dam. The sparkling nine-meter swimming pool, fringed by a rolling green lawn is also a welcomed addition at which to chill in the summer blaze. Explore 2000 hectares of spectacular mountain fynbos with streams, mountain dams, birdlife and various animals such as bucks, fallow deer, Nguni cows and even a very shy leopard at Pat Busch Mountain Reserve. The reserve is also home to a rare Protea Flower that was thought extinct for almost 50 years and is now under protection of Cape Nature. Indulge in delicious local food and wine at AfriCamps at Stanford Hills, an exciting slow food destination with chefs serving an array of fresh and locally produced food. The 5 glamping tents are situated on the foothill of the Klein River Mountain range overlooking a dam and the Stanford Valley. This foodie delight is only a fifteen minute drive from Hermanus and can be reached from Cape Town in two hours. Stanford Hills Estate is fast becoming one of the area’s most popular attractions. The farm produces Proteas and Pincushions, which are endemic to South Africa, so from August through November the farm is filled with these colourful blooms. The farm offers horse-riding, hiking and even whale-watching by air in a small airplane which takes off from the farm’s private landing strip. You can also have a swim in a farm dam, try your hand at fishing, or simply lie in bed and listen to the birds. AfriCamps at Ingwe is situated in the Crags, a lush forest and Fynbos area embraced by the coastal town of Plettenberg Bay where you can experience all the Garden Route is so famous for. Our high elevated tents boast outstanding views of rolling green hilltops surrounded by deep indigenous forested valleys and the Tsitsikamma Mountain Range. 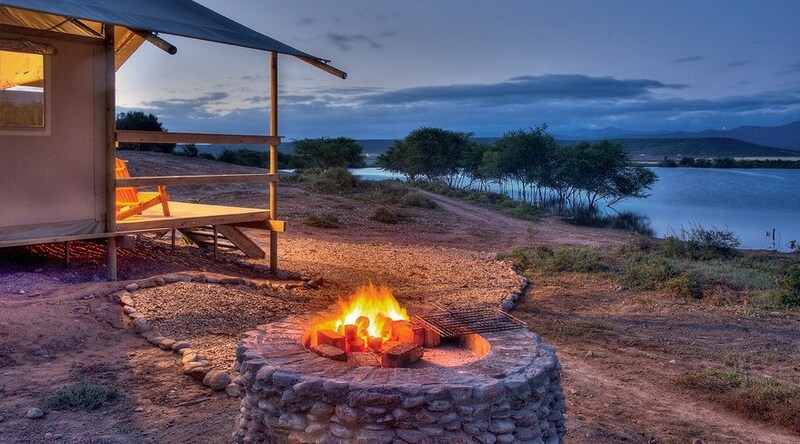 Three of the tents now offer a private wood-fired hot tub where you can take in the breathtaking view while listening to the crackle of fire under the African sky. AfriCamps at Ingwe is an outdoor adventurer and nature lover’s paradise. From Monkeyland, Birds of Eden, Jukani Wildlife centre, Hog Hollow Horse Trails, Plettenberg Bay Game Reserve, delightful canoeing trips up the Bitou & Keurbooms River to a visit to one of the many beaches or wine estates around the corner, one is spoilt for choice! 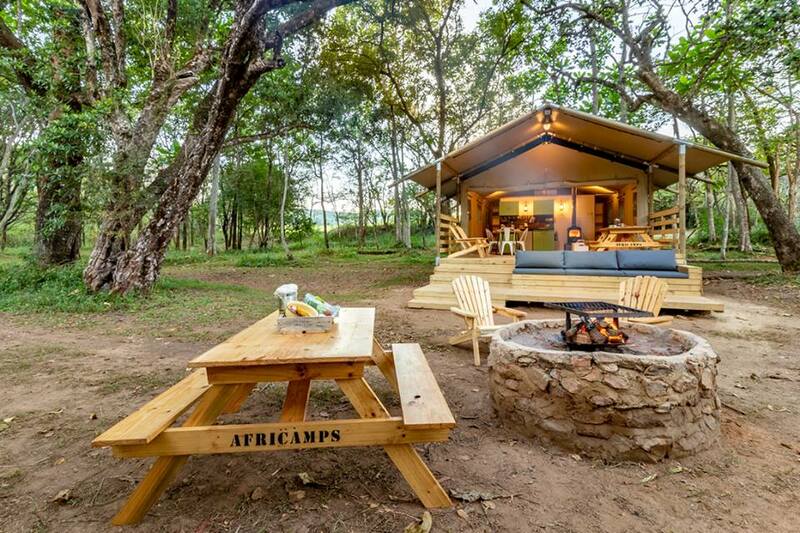 AfriCamps at Mackers is the first camp outside of the Western Cape and is magnificently set on the bank of the Sabie River. Ten luxury boutique glamping tents all face the river just a few meters from the streaming water and are surrounded by lush green grass and indigenous forest. 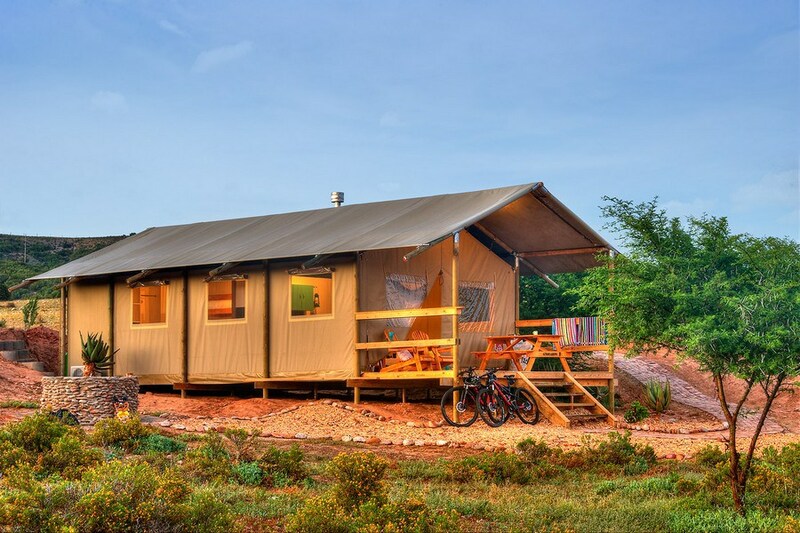 The camp is just a few minutes’ drive from Hazyview, ideally located to visit the Kruger National Park, drive along the Panorama Route to experience the breathtaking scenery and wonder of God’s Window, 3 Rondavels and Bourke’s Luck potholes. Hear the nearby wild animals at night from the comfort of your luxury tent or walk a few meters over the soft grass to dip your toes into the river right in front of you. Spend some time in your own backyard taking a swim in the large swimming pool or taking a beautiful hike from your tent to admire the breathtaking scenery of waterfalls and wild rapids further up the river.